This article is about the X-Wing Pilot in 75102 Poe's X-Wing Fighter. For the X-Wing Pilot in 75125 Resistance X-Wing Fighter, see Snap Wexley. 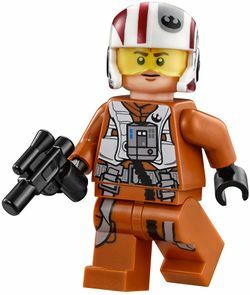 Resistance X-Wing Pilot is a Star Wars minifigure released in 2015. The X-Wing Pilot was released on "Force Friday" in 2015, in one of the first Star Wars Episode VII sets. This pilot's headpiece is flesh coloured with printing for a face with a serious expression- two black eyes with white pupils, dark brown eyebrows, dark flesh printing for facial detailing for the chin and one mark on the forehead, and a black line for a mouth. The minifigure's body and leg pieces are dark orange and based on a Resistance flight suit. The body piece has black hands, and printing on the front and back. A white vest worn over the orange suit is printed on both sides, as is a grey belt with straps hanging off the front, and both are outlined and detailed in black. The belt also features some dark grey areas for clasps for straps and further detailing. On the front of the top left-hand side of the vest is a black starbird used as a logo for the Resistance (and formerly the Rebel Alliance), and in the centre is a grey rectangular life support system. The system has a dark grey area in the centre, and dark grey, blue and white buttons on it. Connected to the bottom of the life support system is a black tube, which continues on to the legs. The tube printing is printed on the leg joint and the left leg, which ends about half-way down the leg and goes into a pocket outlined in black. The legs also feature an empty pocket on the other leg, and two grey straps continuing from the body, with one clasp on each strap. This Resistance Pilot comes with two accessories- a black blaster pistol and a white Resistance helmet. The helmet has a transparent yellow visor, and printing on the white area of the helmet including silver dots rectangular areas, and a large rounded rectangle above the visor on the left-hand side in grey. Inside this area is a black Resistance starbird, and another starbird is present on the right-hand in flame yellow. The helmet also has four small flame yellow dots on the helmet (two on each side), with a black "v" shape on each of them. Several dark red stripes and areas are also present, as are some black stripes, and some other small black designs, including the text "MOTHER" in Aurebesh on the right side above one of the black stripes. After the Resistance was formed to serve as a check against the First Order, pilots were recruited to the organisation. T-70 X-wing pilots saw action against the First Order during the Battle on Takodana, and soonafter, Commander Poe Dameron led Blue and Red squadrons in the Battle of Starkiller Base. Though the two squadrons suffered heavy losses with only seven fighters surviving, their mission was successful and Starkiller Base was destroyed. The Resistance X-Wing Pilot in LEGO Star Wars: The Force Awakens. Facts about "Resistance X-Wing Pilot"
This page was last edited on 6 July 2016, at 13:02.